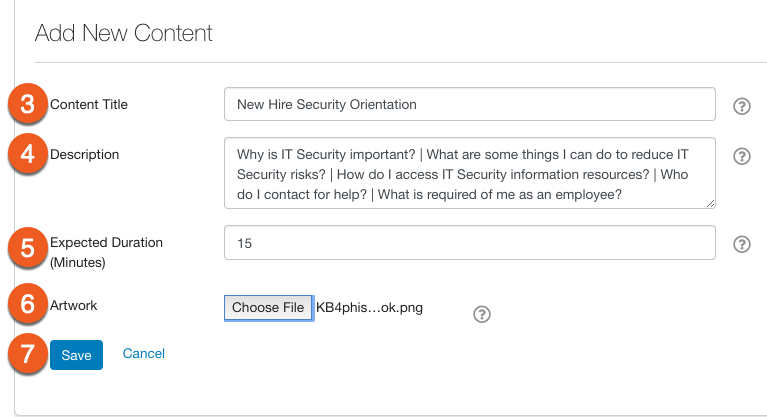 How Can I Upload Custom Content to Use in My KnowBe4 Account? If you'd like to supplement KnowBe4's library of training content with your organization's customized training courses, you can do so in your KnowBe4 platform. You'll be able to upload your own content and assign it in training campaigns as you would with any training module, video module, or game from the ModStore. Your users will view the uploaded courses from the console's learner experience (LX), and their progress is tracked in the Training section of your console. You'll upload and manage your content under the Uploaded Content tab, in the Training section of your console. After adding a new set of content, you'll upload one or more language files (in the form of SCORM or video files). See the sections below for instructions and best practices for uploading custom content. See below to review the compatibility requirements for uploading content to your KnowBe4 console. You will upload one or more Shareable Content Object Reference Model (SCORM) file packages or videos for each custom course. You are required to add a thumbnail image for your uploaded content. Before you upload custom content, you'll begin by adding general details such as a title and a short description of the course. Navigate to the Uploaded Content tab under Training. Content Title: Add a descriptive title for your course. Your users will see this title when they log in to complete their training. Description: Add a short summary explaining the topics included in your course. Adding a description can help admins decide which course to assign in a training campaign. Users can see this description when the course is at the top of the assignment list in their learner experience. Expected Duration (Minutes): Enter the estimated time it will take the user to complete the course. Enter a value between 1 and 360 minutes. Artwork: Use the Choose File button to upload an image to represent your content. Users will see this thumbnail image in the KnowBe4 LX before they start the course. Images can either be a JPEG or PNG file type and must not exceed 10 MB. To ensure your artwork displays correctly in the LX, the recommended image dimensions are 500 x 500 pixels. 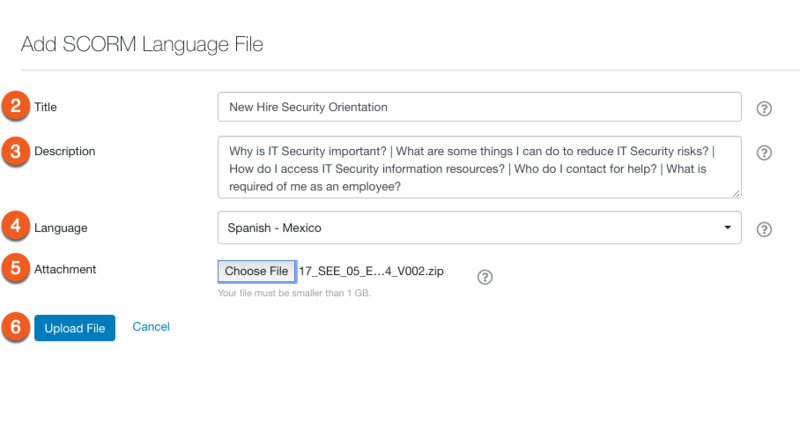 After providing the details above, you'll upload one or more language files to your content set. You only need multiple language files if you need your course to support multiple languages. For example, if your organization has international offices or subsidiaries in different countries, you may need content available in multiple languages. By uploading all of the language files to one content set, you'll assign one course to all of your users and they'll choose their native language before beginning the assignment. See How Do I Change the Language of Training Content? for an example of the user experience. After you've created a new content set (see Adding Content Details, above) you'll upload at least one language file for your course. You can add as many language files to the course as necessary for your organization. Title: When adding a language file, the content title will populate by default. You can optionally change the language file title to the language of the content you're uploading. Users will not see language file titles when they log in to complete their training–the content title will be displayed for all languages of the course (see How Do I Change the Language of Training Content? for an example of the user experience). Description: You can use the description field to provide additional details for this version of the course. If you have several language files for the content set, the description details may help you better manage your courses. Users will not see the language file description–the content description will be displayed in the users' learner experience. Language: Select the language of the SCORM file's content. Users can select this language from a drop-down menu before they begin the training. The first language file you add for the content establishes the default language of the course. If users do not select a different language, the course will play in the default language. You can change the default language of the content after adding additional language files. See the Edit Content and Language Files section for details. Attachment: Use the Choose File button to locate your SCORM file. See the Content Requirements section above to ensure your file package is compatible. Use the Upload File button to upload this language file to the content set. Your file will be scanned for viruses before it is uploaded to the console. The time it takes to upload your SCORM file depends on your internet connection speed and the size of your file. Please do not navigate away from the page before the upload is complete. Once you've uploaded your SCORM file, see the Verifying Language Files section below for instructions on the verification process. After you've created a new content set (see Adding Content Details, above), you'll upload at least one language file for your course. You can add as many language files to the course as necessary for your organization. Language File Title: When adding a language file, the content title will populate by default. Changing the language file title is optional. Users will not see language file titles when they log in to complete their training, the content title will be displayed for all languages of the course. Language: Select the language of the video file's content. Users can select this language from a drop-down menu before they begin the training. Video File: Use the Choose File button to locate your video file. The video must be in MP4 format and smaller than 500 MB. WebVTT file (optional): WebVTT files can be used to display subtitles or captions on your content. Use the Upload File button to upload this language file to the content set. Your video will be scanned for viruses and converted to a SCORM file package (for LX compatibility) before it is uploaded to the console. The time it takes to upload your video file depends on your internet connection speed and the size of your file. Please do not navigate away from the page before the upload is complete. Once you've uploaded your video, see the next section for instructions on the verification process. Once you've uploaded your language file, an automated verification is performed. Once the automated verification is complete, follow the instructions below to manually review the file to determine whether your course will successfully play in the KnowBe4 learner experience. If you're having trouble completing the review steps or if your course is not behaving as expected, see: Having Problems Uploading Custom Content? Launch File: Click this button to launch your file in a new window. Take note of the time that you launched the course. Once you launch your file, the verifications should begin to auto-populate. Launch the file. Does the file start successfully? If the course successfully launches, the current date will populate on the right. Click the checkbox to the right of the date to verify this step. Continue reviewing the file. Is the time you've spent viewing the file indicated accurately? Navigate through your course and note whether the amount of time you've spent in the course is accurately reflected on the right-hand side. If so, click the checkbox to verify this step. Finish reviewing the file and close the window. Does your status show as Complete? Navigate through and complete your entire course. If the course shows Complete on the right-hand side, use the checkbox to verify this step. This verification step will show Complete or Incomplete regardless of whether the SCORM package has a Complete/Incomplete or Passed/Failed reporting status. Need Help? Use this link to navigate to our Having Problems Uploading Custom Content? article. Approve File: Once you've confirmed the steps above, use this button to complete the review. See the next section for details on publishing language files. After verifying that your language file is compatible, you must publish it before it can be used. Once published, the course will be available to assign in training campaigns. Use the link to read the Terms and Conditions for uploaded content, then click the checkbox to agree. Click the Publish button on the right-hand side to make your language file available in training campaigns. As a best practice, before assigning uploaded content to your users, we recommend enrolling yourself or a small group of admins into a test training campaign with your custom content as the assignment. This way, you can ensure the time spent in the course and the completion status is accurately recorded in your console. If you're publishing a new language file, the newly-published language will be immediately available to all users in the campaign. If you're replacing an existing language file with a newly-uploaded file, all users who have not completed the course will have their progress reset–regardless of which language file is affected. You'll manage and update your uploaded courses from the Uploaded Content tab, in the Training section of your console. Click View to the right of any uploaded content to view and edit that content. Toward the top of the View Content page, you'll see general information about the content, and on the bottom portion of the page, you'll find the language files you've uploaded. The Artwork you've uploaded for this content. The title you've created for this content. The description you've added for this content. Expected Duration: The amount of time you've estimated this course will take to complete. Last Updated: The date and time that the Content Options (i.e., items a., b., c., d., or f.) or language files were last updated. Default Language: The language selected during the first language file upload establishes the default language for the content. You can change the default language by editing the Content Options once you've added two or more language files to the content set. From the View Content page, use the Preview links to preview language files. If you'd like to change a language file's title, language, or description, or update it with a new SCORM file package, click the Edit link. All users who have not completed their course will have their progress reset, regardless of which language the user is taking the content in. Navigate to the Training > Uploaded Content area. Click the Actions drop-down next to the content you'd like to archive. Navigate to Training > Uploaded Content. Click the Archived link to view all content you've archived in the past. Click the Actions drop-down next to the content you'd like to restore. Once you've published one or more language files for your uploaded content, you can assign your course in training campaigns. When creating your campaign, you'll find uploaded content in the Courses section of the Content drop-down menu (shown below). See the Editing Language Files section above for important information about updating language files when uploaded content is assigned in an active campaign. 1) Question: Why isn't my uploaded content available for selection when creating a training campaign? Answer: Before you can assign uploaded content to your users, you must verify and publish one or more language files for the content set. 2) Question: How can I preview my uploaded content before assigning it in a training campaign? Answer: After your uploaded content has been verified and published, you can preview your course from the View Content page. Click the Preview link toward the right side of any language file that has been added to the content set. 3) Question: Why am I getting an error message when trying to upload my SCORM or video file? Answer: If you're having trouble uploading your files, see this article: Having Problems Uploading Training Content? 4) Question: How are antivirus detections performed on SCORM files? Answer: The platform uses ClamAV to scan all uploaded language files. 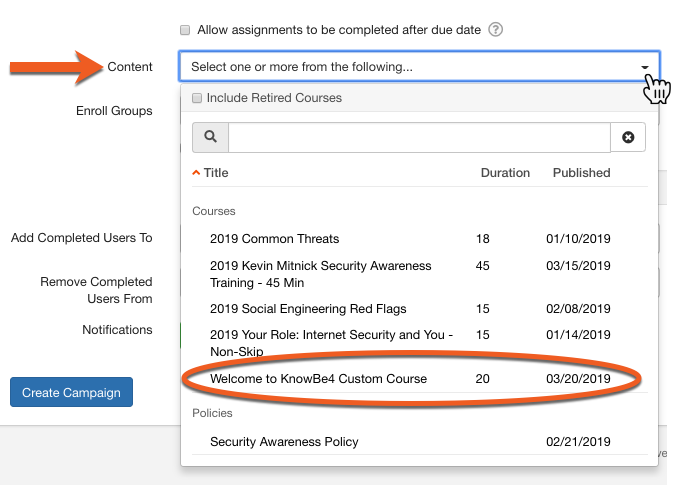 5) Question: How many courses can I upload to my KnowBe4 account? Answer: You can add up to 100 custom courses to your account. Each course, or content set, can contain as many language files as needed for your organization.